What’s Jamie Roberts Up To? The Legend of Jamie Roberts is now fully scripted! I’m at the point now where I can draw concept art, like the art above. 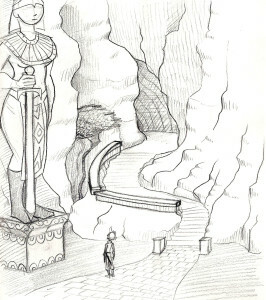 That tiny person towards the bottom is Jamie, and she is standing in the abandoned underground city of Kinyaht. There will also be a LOT of editing over the next month. I’ll be obsessively using How To Revise A Novel as a reference during the process. If you’re editing your own work, USE THAT LINK. It will save you a lot of stress.